Korea traces its claim back to 512, when the Shilla Kingdom conquered that small island-nation of Usanguk on Ulleungdo. As you seen in the first paragraph of the section below, Koreans tend to tie Dokdo's fate with Ulleungdo (more on that later). In 512 A.D., the Silla Kingdom conquered Usan‐guk (Usan State), of which the main part was Ulleungdo. Since then, the Korean people have considered Dokdo to be a part of Ulleungdo. I am personally a little leery of the 512 date because there is some evidence that Korea lost sovereignty of the island to the Jerchun in the 9th century (sorry, no link for that one) but regained it soon after. Also, with the exception of Israel, such really old claims aren't used to successfully lay claim to a piece of territory. Otherwise, we could have Korea claiming half of Manchuria and China asserting that it owns the northern half of Vietnam. A lot can change over 1500 years. Also, as you will see below, the 512 date is from a history book written in 1145, over 600 years later. Whatever the true date of Korea's claim to Dokdo begins, it is a pretty safe bet that it predates Japan's 1618 claim (see below). The subsequent Korean states, namely the Goryeo Dynasty (918~1392), the Joseon Dynasty (1392~1897), the Daehan (or Korean) Empire (1897~1910) and the Republic of Korea (since 1948), have exercised sovereignty over Dokdo. Samguksagi (History of the Three Kingdoms) is an official history book written in 1145 A.D. on the Three Kingdoms of Korea, namely the Silla (57 B.C. to 935 A.D.), Goguryeo (37 B.C. to 668 A.D.), and Baekje (18 B.C. to 660 A.D.) kingdoms. This book, edited by Kim Bu‐sik, a historian and the then prime minister of the Goryeo Kingdom, contains the story of the conquest of Usan‐guk in 512 A.D. by Isabu, a general of the Silla Dynasty under the reign of King Jijeung. * Sillok, which is mentioned in the following references, means annals, or historical records, compiled and published by the government throughout the time of the Joseon Dynasty. Each king's name was added before the word sillok, in order to indicate that it covered the history of the Dynasty during the reign of that king. Sejong Sillok Jiriji was compiled as part of the Annals of King Sejong (1418‐1450) of the Joseon Dynasty. The Jiriji (geography book) contains a variety of information needed to govern the country, such as the administrative history of each local government, the topographical features of administrative units, their populations, and roads. The book refers to Dokdo and Ulleungdo as follows: "Usan [Dokdo] and Mureung [a former name of Ulleungdo] are located in the middle of the sea, due east of this Prefecture. These two islands can be seen from each other in good weather, as they are not far apart." The Japanese claim that Ullung and Usan both refer to Ulleungdo, but Korea already knew of Ullungdo and Dokdo in the 17th century. The precise location of Ullungdo and Usando are shown in the (Dongkuk Geography) by Jung Sangik in the 18th century. In maps from the end of the Chosun Period, Usando is always shown next to Ulleungdo. (YANGBAN NOTE: You can click on the map for a slightly larger image. I think that is the right map but there were several on the page. According to Seongjong Sillok, the Annals of King Seongjong (1469‐1494), an official investigative team sailed for Sambongdo (Dokdo) and reported to the royal court as follows: "We dropped anchor at seven or eight li [about three kilometers; one li equals 400 meters] west of the island… We drew a picture of the island and came back." 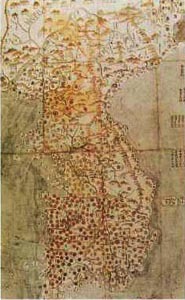 Sinjeung Donggukyeojiseungnam (The Revised and Augmented Version of the Survey of the National Geography of Korea) was published in 1531 as an enlarged edition of the 1481 Donggukyeojiseungnam (Survey of the National Geography of Korea), which dealt with Korea’s cultural geography, such as historical figures associated with different areas and poetical works inspired by the local scenery. As in the above‐mentioned excerpt from Sejong Sillok Jiriji, this book describes Dokdo and Ulleungdo as part of the Korean territory in the East Sea, and states: "The two islands are located in the middle of the sea, due east." According to Sukjong Sillok, the Annals of King Sukjong (1674‐1720), Ahn Yong‐bok rebuked some Japanese fishermen for staying at Ulleungdo and Dokdo and warned them against returning to these islands in the future. Sukjong Sillok further records that Ahn Yong‐bok went twice to Japan in order to protest against Japanese nationals trespassing into Korean territory. He asked the Japanese authorities to recognize Korea's sovereignty over these islands and to forbid Japanese nationals to sail to these islands. Consequently, the Japanese Government prohibited its nationals from sailing to the Ulleungdo region. Jeongjo Sillok, the Annals of Jeongjo (1776‐1800), reports that, following Ahn Yong‐bok’s actions, inspectors were dispatched every three years by the Government to Ulleungdo and Gajido (Dokdo). Imperial Decree No. 41 was issued in 1900 by Emperor Gojong (1864‐1907) of the Daehan Empire as a measure to reform the traditional administrative system. This Decree placed Dokdo under the jurisdiction of the Ulleungdo County office. The Decree stipulates: "…the Headman of Uldo [a newly designated County of Ulleungdo] shall have jurisdiction over Ulleungdo, Jukdo and Seokdo [Dokdo]…"
It is also evident from this description that the Japanese knew that the islands of "Uruma" (Ulleungdo -Yangban) belonged to Silla before Koryo. Although these first Japanese documents do not mention Tokdo or Usan'guk, they clearly recorded that Ullngdo belonged to Shilla first and then to Koryo. However, as Tokdo was appended to Ullngdo, was associated with it and constitured part of Usan'guk, the documents reveal that the Japanese involved were cognizant that Usan'guk, comprising Ullngdo and Tokdo, belonged to Silla and then to Koryo. Here is the logic at work in the Korean position: (1) Ulleungdo is acknowledge by Japan as Korean territory and (2) the fate of Dokdo is tied to the fate of Ulleungdo, therefore (3) Japan should acknowledge that Dokdo is Korean. In 1696, as a result of negotiations between Japan and Korea concerning fishing in the vicinity of Utsuryo Island the Shogunate prohibited passage of vessels to Utsuryo (Takeshima Ikken), but did not prohibit passage to Takeshima. So Korea's ownership of Ulleungdo does not automatically end the dispute over ownership of Dokdo. The claim to Dokdo will have to stand on its own merits. Even the famed case of An Yong-bok leaves some questions (taken from historical section above): Ahn Yong‐bok rebuked some Japanese fishermen for staying at Ulleungdo and Dokdo and warned them against returning to these islands in the future. Sukjong Sillok further records that Ahn Yong‐bok went twice to Japan in order to protest against Japanese nationals trespassing into Korean territory. He asked the Japanese authorities to recognize Korea's sovereignty over these islands and to forbid Japanese nationals to sail to these islands. Consequently, the Japanese Government prohibited its nationals from sailing to the Ulleungdo region. In 1696, the 22nd year under King Sukjong's reign, 16 fishermen, including An Yong-bok of Dongrae, went to Ulleungdo island. When Mr. An saw Japanese fishermen and fishing boats, he rebuked them as to why they were on Korean soil. The Japanese responded that they were residents of Takeshima and came to Ulleungdo island for fishing. They claimed that Tokto was a part of Japanese territory. Had the Japanese not told Ahn that they were based out of Dokdo, he might not have even known that they were there. The Japanese decoupling of of Ulleungdo and Dokdo does not by itself undermine Korea's claim to the later islands, but it does mean that Korean arguments based on the assumption that what goes for Ulleungdo also goes for Dokdo do little to put the issue to rest. Is is Dokdo, Sokdo, Jukdo or Gwaneumdo (or Takeshima or Ulleungdo)? You will see that three islands comprise Ullungdo, the main island and the much smaller Kwanundo and Chukdo to the east. Japan has always contended that the three islands in Ordinance 41 points to these three islands, not to present-day Takeshima. Note that both Chukto and Takeshima are written as "bamboo island" in Chinese characters. It seems a far more natural interpretation than the Korean claim that the latter two are present-day Takeshima, two pieces of rocks located 80 km away. I think it is the Koreans who are choosing to ignore the fact that another island named "Takeshima (bamboo island)" exists in the extreme vicinity of Ullungdo. Article (1) of the ordinance designated Taehadong as the kun office venue and defined the jurisdiction of the Uldo country magistrate as extending over the whole of Ullungdo, Chukto, and Sokto. Here Chukto refers to Chuksodo, a rocky islet adjoining Ullungdo that was confirmed by Yi Kyu-won in his diary during an inspection trip there. Sokto is Tokdo. A majority of the people who settled on Ullungdo were from Chollado. In the dialect of that region tol (石 in Chinese character) is prnounced as tok, thus tol-som (rocky island) becomes tok-som. As a result the government registered the island as Sokto or 石島 in the Chinese writing system -- the preferred literati-official (as was Latin under Roman occuption and French after the Norman conquest in Great Britain) even after the creation of han'gul as the indigenous alphabet in 1447. A plethora of similar cases can be found not only in the names of islands but also those of valleys. This is especially true for the southern regions of Korea. In some cases tok-som is pronounced tok-to and is written with the Chinese characters 獨島. The sound tok or tol is the Chinese character 獨, and 島 is the Chinese character for island -- namely, som or to. Although the government adopted the name of Sokto for Tokdo when the ordinance came into effect, the residents of Ullungdo called the island either Sokto or Tokdo. That is not just a Korean problem. The Japanese name for Dokdo (Takeshima) was once their term for Ulleungdo. Much of the Korean historically-based claims to Dokdo seem to be based on the problomatic assumption that references to Ulleungdo automatically also refer to Dokdo. As the Japanese claims separate Dokdo from Ulleungdo, the Korean side needs to prove that Dokdo's fate is tied to that of Ulleungdo rather than assuming it. As they rarely rise to that challenge, much of the 'proof' of their historical claims seems to fall short. On the other hand, if the Korean side had always assumed that Ulleungdo and Dokdo were part of the same claim, then there would have been little reason for them to mention the islands individually. When Americans say that we own Alaska, we don't feel the need to separately mention all of Alaska's outlining islands such as Little Diomede. It is certainly possible that the same would apply to some of the Korean historical references. In other words, the failure to mention Dokdo separately from Ulleungdo does not necessarily mean that Korean's didn't in fact assume that Dokdo was theirs. The Korean side does have some separate references to Dokdo, most notably Imperial Ordinance Number 41. While these do not disprove Japan's claims, they clearly show that Korea had their own claims to the island. So, I would say that Korea's claim to Dokdo prior to the 1905 annexation is as least as strong as Japan's. Time for an honest admission. With all the renaming and misnaming of the islands in the area, it is difficult to for me to determine which references are to Dokdo and which may be to something else. While I am doing my best here, what is really needed is a much more detailed study by a historian who is well versed in old-style Chinese writing who is neither Japanese, Korean or Chinese. If anyone out there knows someone who fits the bill, point him in the right direction and tell him to get to work. Excellent, excellent post! Keep it up. I'm bookmarking this as a reference on this issue. Actually, I'm more interested on what the basis for this conclusion was. On August 10, 1951, Dean Rusk, the US Assistant Secretary of State for Far Eastern Affairs, replies in writing that "Based on the information we have, the U.S. concludes that at no time in history has the Liancourt Rocks ever been a territory of Korea." What amuses me is that, whenever a Korean presents a map showing Dokdo as evidence, the map never says the East Sea (to their horror, it usually says the Sea of Japan), and whenever they present a map with the East Sea, it never depicts Dokto as their territory. Based on the information we have, the U.S. concludes that at no time in history has the Liancourt Rocks ever been a territory of Korea. Yangban: "Whatever the true date of Korea's claim to Dokdo begins, it is a pretty safe bet that it predates Japan's 1618 claim (see below)." 우산국은 명주(溟州)의 정동쪽 바다에 있는 섬으로 혹은 울릉도(鬱陵島)라고도 한다. Usan-guk, also called Ulleungdo, is an island in the ocean, directly east of Myeongju." You can go here to read the Chinese character version. Not only does the quote refer to Usan-guk as "an island," not "islands," it very clearly says that it is also called "Ullungdo." Based on the above leap in logic, Korean historians have created a whole history for Tokdo, an group of barren rocks that is not shown on any Korean map before 1905, the year Japan incorporated them. Yangban: "There may be some validity to the claim that Chukdo (Jukdo) is a reference to the island much nearer Ulleungdo. However, I see no reason to believe that the reference to Seokdo actually means Gwaneumdo. While Chukdo is at least some distance from Ulleungdo, Gwaneumdo is little more than an extension of Ulleungdo's north-eastern corner separated by a small channel (see map here)." Gerry: Ullung-do has two islands just off its shore, Chukdo and Gwanundo. Here is a picture of the two islands seen together. It seems obvious to me that the "Seokdo" mentioned in Ordinance 41 (1900) was referring to Gwanundo, not Tokdo. Why would the ordinance specifically mention Ulleungdo and Chukdo, but not Gwanundo? Because Gwanundo is nearer to the shore of the main island? I think it is much more "unlikely" that Seokdo was referring to Tokdo, since Tokdo is 92 kilometers away and out of sight at sea level. If the ordinance were referring to Tokdo, I think it would have, at least, mentioned Tokdo's direction and distance since it was not in the immediate vicinity of Ulleungdo, the island the ordinance was describing. Also, a 1899 document describes Korea's eastern-most boundary as a longitude that includes Ulleungdo, but not Tokdo. A 1906 revision of the document also fails to include Tokdo within Korea's eastern-most boundary. Also, even acknowledging that Seokdo could be pronounced as "Dokto" in the Cholla province, which is on the other side of the Korean pennisula, the explanation for the Chinese character change from "Rock Island" to "Lonely Island" is very, very labored. Plunge to Passerby: "Where did you get this quote?" Gerry: Here, in footnote 3. It seems to me that the biggest reason for all this Dokdo-Takeshima nonsense is because it is almost a neologism to apply modern ideas of sovereignity to a (usually) uninhabited island in the middle of the sea. It's not like people could hop on a ferry and have a picnic there. There weren't spy planes keeping an eye on the place. Pirates were a fairly constant problem. Fishing waters were full back then, and no one was thinking about controlling natural gas reserves that might (or might not) be there. Takeshima belongs to Japan. It is in the internation accord in 1945. Thanks, Mr. Bevers, for your tireless effort searching subdomains of a site either by or about Shintaro Ishihara titled "Declaration of War." "Thanks, Mr. Bevers, for your tireless effort searching subdomains of a site either by or about Shintaro Ishihara titled "Declaration of War." "
Mr Rusk continued: "As regards the island of Dokdo ... this normally uninhabited rock formation was according to our information never treated as part of Korea and, since about 1905, has been under the jurisdiction of the Oki Islands Branch Office of Shimane Prefecture of Japan. The island does not appear ever before to have been claimed by Korea." Good points mr Beavers. When ever I see your name, lots and lots of koreans seem to insult you. You however never seem to have anything negative to say back. I share your opinion about the island Takeshima. It seems that if you try and be reasonable you may be attaced in KOrea. So I suggest you be careful. Uhhhh.... 'Dingles' said 'Beavers.' Huh, uh, huh, huh. BTW, does anyone think the current Lee Sun Shin drama is only a coincidence? Time to bring back the Ko-buk=san, eh wot? Oranckay: "...sneaky slight of hand..."? Gerry: Actually, Oranckay, you seem to be the one trying to divert people's attention away from the fact that the Korean map shows Usan-do (i.e. Dokdo) direct to the west of Ullungdo instead of to southeast. I linked to the blowup so that people could read the names of the islands, not to divert their attention or attempt any "sneaky slight of hand." Oranckay: "So, the reason one of the two on that particular map is probably not one of the tiny little sub-islets a few hundred meters off Ulleungdo is because none of the other islands in the *whole* map have their sub-islets drawn next to them." The last map, make in 1899, not only shows Usando in the exact same place as Chukdo (see Chukdo on this map), but the textbook it is printed in says that the Ullung administrative district extended east to a longitude of 130 degrees, 35 miniutes. That longitude includes Ullungdo and its surrounding islands, but not Dokdo/Takeshima, which is farther southeast at a east longitude of 131 degrees 55 minutes. Then one year later, in 1900, the Chosun Empire's Imperial Ordinance 41 placed Ullung-do, Chuk-do, and Seokdo under Ullung County administration. Chuk-do is the small island just on the east coast of Ullung-do, but the name Seok-do appears for the first time. Koreans claim that Seokdo is a reference to Dokdo/Takeshima, but I believe it is a referrence to Kwanundo, another island just off the east coast of Ullungdo (See this map). Also, here is a picture that shows all three islands: Kwanun-do, Chuk-do, and an arm of Ullungdo. 문; 우리나라의 지도상의 위치는 어떠합니까. 북위 33 도 6 분 40 초로부터 43 도 0 분 36 초까지입니다. 문; 우리나라의 동서남북 극단은 어디입니까? 도서를 넣어서는 극동은 경상북도 울릉군 죽도[독도], 극서는 평안북도 용천군 신도면 마안리, 극남은 전라남도 제주도 대정면 마라도, 극북은 극북은 함경북도 은성군 유포면입니다. Here is the link to the above quotes. Oranckay, you seem to have a little trouble with math, so I will do it for you. 3) 1899 map shows Usan-do in the exact location of present-day Chuk-do, and even includes latitude and longitude lines. The Chosun Empire's Imperial Ordinance 41 says that Ullung-do, Chuk-do, and Seok-do are under the Ullung administrative district. 4) A 1946 Korean book says that "Chuk-do [Dokdo]," an island that belongs to the Ullung administrative district," is Korea's eastern-most island, and that Korean territory, including islands, extends east to a longitude of 130 degrees 56 minutes, 23 seconds. That longitude is far enough east to include Ullung-do and its surrounding islands, but not far enough to include Dokdo/Takeshima, which is at a longitude of 131 degrees, 55 minutes. "Dokdo" is Chuk-do (Usan-do), which is a small Korean island just east of Ullungdo. It is not Takeshima, which means that Korea is illegally occupying Japanese territory. Do you have any links without the words takeshima in them gerrysan ? Maybe "the Beve" is looking to impress a Japanese girl at his high school? would that refrence be for bevers and butthead? By the way Mr beavers, Brilliant truely Brilliant commentary. Its sad that everytime you post logical and polite commentary those people who have already steaked out their side on the issue resort to name calling. In fact they are acting shamefully in their stubborness and closemindedness. Mr Beavers, I can only say that in the 1930s in Germany there were a few people who went against the Govt and so many of the peop le in their opinions. Like you they felt the wrath of so many people and were attacked and attacked. Like you they calmly evenly and logicaly spoke their minds. Yes many of these people were eventually murdered or expelled from Germany. But now we know that theirs was the message of truth. Keep up the fight Mr Bearver! Dont be afraid to be calm, rational, logical, and try and discuss the issues without anger or hatred. The name Shindler comes to mind Mr Beaver. Many many other, Mr Ornicky, are like the those bad bad camp guards who never stop attacking you Mr Beavers. They attack truth, justice and freedom. Others, Mr Yanbang, are like the happpy go lucky baker who look the other way. Simple minded people. But what about Dingles. I am nobody. Gerry, if you are going to post maps please post ones that prove something instead of something a Japanese 3rd grader could have made. This official Japanese map of Chosun clearly shows Ulleungo and Dokdo inside the border and is labelled as Map of Chosun (korea). If Dokdo was part of Japan (or not part of Korea)it would have been drawn outside the boundary. It was made in the 19th century before the 1905 Shimane Prefecture Inclusion. Try the link to this old Japanese Tokdo map as mentioned it shows Dokdo cleary inside the boundary. This old military map from 1936 shows that Dokdo was still under Chosun or Korean jurisdiction despite military occupation of the peninsula. map showing Dokdo under Korean jurisdiction This map is also Japanese. Korea doesn't have to show ownership of Dokdo by using ancient records. Japanese documents verify it for them. In this Japanese map of Korea. The Japanese cartographer drew Korea and included Ulleungdo and Dokto. Notice he even included great detail of the islands. Also note Japan is not included on the map. Another Japanese map of Korea has a closeup of the island to prove they are well inside the boundary showing Dokdo as Chosun or Korea. French map shows part of Ulleungdo and Usando as part of Korean Land. You can see the French cartographer like the Koreans called Dokdo Usando (in French). A Russian Navy map of Korea also includes Dokdo Island as part of Korea and well within the boundary of the map. Thanks for providing the follow-up info. Since the meridian skimming the west coast of the Korean peninsula is 125 deg, and that between the two islands (which you seem to think are Ullungdo and Tokdo), are 130 deg, you find that the meridians are drawn at 1 deg intervals. So are the parallels. This means that the island on the left of the 130th meridian is located between E129-130 deg. long. and N37-38 deg. lat, and the island to the right is located between E130-131 deg. long. and N37-38 deg. lat. Since this map was created during the period of the two-Ullungdo confusion (Dagelet and Argonaut), I think a natural conclusion as to the identity of the two islands is: left = Argonaut and right = Dagelet. Liancourt Rock (= present-day Takeshima) is located near the 132th meridian. This is not a map showing the administrative jurisdiction, but is a map showing the Japanese Army jurisdiction. Since Takeshima was closer to Ullungdo, Takeshima was covered by the same unit. Remember, all of Korea was a part of Imperial Japan at the time, Just like Okinawa is presently a part of Japan. For example, even if the same Self Defense Force unit were to cover Okinawa and Amami-Oshima (a part of Kagoshima), Amami would still be a part of the Kagoshima prefecture. I have telephoned the Shimane prefecture to ask whether Takeshima had ever been removed from its administrative jurisdiction during the annexation, and the answer was NO. I don’t know what this implies, since the Chinese character written on the triangular island on the left says Utu-to (the first of the two characters in Ullung + island), and seems irrelevant. Furthermore, from its triangular shape, I'd say this is Chukto (bamboo island) adjacent to Ullungdo. If this were Dokto, there would be two islands drawn. 4) Japanese map – Can’t seem to view this. Note that Takeshima is the island CLOSER to the Korean peninsula. This is the non-existent Argonaut Island. It wasn't until after 1880 when the navy vessel Amagi was dispatched by the Japanese government that the Japanese government formally acknowledged that Argonaut (then called Takeshima) was non-existent, Dagelet (then called Matsushima) was Ullungdo, and the Liancourt rocks (then called Rianko-jima) was what had formerly been known to the Japanese as Matsushima Island. Note that both the coordinates and the shape of the Matsushima Island in this map correspond to Ullungdo. Takeshima is drawn as a simple bubble, probably due to the fact that its shape couldn’t be confirmed, for obvious reasons. Though Koreans claim that Usan = Dokto = Takeshima, I do not find their line of logic convincing, because in Korean historical records (San-guk ki), it says that there was a permanent settlement of 86 people (15 houses and farmland) on Usan. The description simply does not fit Takeshima. I think the two islands depicted here are Dagelet Island (Ullungdo) and either Boussole Rock or Seal Island. Besides, it wasn't until 1849 that Liancourt Rocks were “discovered” by westerners. I don't know what you want (or the person of this website wants) to point out using this map, as it only shows Ullungdo. This map contains no borders, colors, etc. indicating that the Russians were not even minutely concerned with who owned the islands or the peninsula. Instead, the Russian painstakingly map out islands in the sea and the coastline, which indicate to me that they are preparing for an invasion southward. The original map was made by the Russian navy in 1857, immediately after the Russian loss of the Crimean War, in which the Russian hope for reaching open waters on its western side was crushed. It seems they promptly turned their eyes to the east. On May 15, 1861, the Russians occupied Tsushima by force, and refused to leave until the Japanese government gave a written lease of Tsushima to Russia. (Thanks to the British, the Russians were driven away on this attempt.) Mapmaking is not a simple pastime for a nation. Even today, charting of seafloor is of national importance, and that is why you see Chinese subs entering Japanese waters. The fact that the Chosun dynasty allowed the Russians to map their shores in detail shows how woefully unaware they were of the danger. This map shows the situation of the Argonaut, Dagelet, and Liancourt as acknowledged by Japan and the world at 1872, before it was finalized that Argonaut was non-existent (and was the result of poor measurements by a British man, James Colnett back in 1789). passerby you can't be serious!! You critize and scrutinize the maps posted and then you post those scrawlings (that look like a neanderthal did them) as gospel. You've got a serious case of "Gerry Bevers" syndrome. You can ignore the "neanederthal" drawings, my logic is still valid without them. I gave the link to the "neanederthal" drawings as schematic illustrations to show the coordinates and names of the islands since the other elaborate antique maps need more magnification than the images offered on the web to see the names, etc. You're not going to say that the last map I gave is a neanderthal drawing, now are you? I do not take the illustrations as gospel. For that matter, I do not trust wholeheartedly any information presented on the web. However, after making independent searches through online collections of 19th century antique maps, I have reached the conclusion that this drawing correctly illustrates the situation back then. At least, I do not take as gospel colorful elaborate maps that does not even contain Tokto or Takeshima and try to convince others that they do. You, wedgie, seem to be the one with the blind faith. BTW, the 1945 Korean map in your link does seem to be a map of Ullungdo. The Korean government renamed 鬱陵島 to 鬱島 in Ordinace 41. The map on the right-hand side, I guess, is the main island of Ullungdo. >You've got a serious case of "Gerry Bevers" syndrome. Why thank you. I'll take that as a compliment any time. The Japanese forgot something on this map. The Japanese also argue that Korea didn't dispute the illegal incorporation of Tokdo into Shimane Prefecture or even know Dokdo existed. Apparently the govenor of Ulluengdo was pissed enough to raise the Korean flag in defiance in 1906. I think it's absolutely hilarious you call the Shimane Prefecture office for their opinion on the matter!! Everyone knows the terra nullius claim of Dokdo was a sham. The Shimane Prefecture Inclusion was declared dead by the signing of the SCAP agreement. If the Shimane Prefecture office wants to live in denial that's their perogative I guess.